Driver’s side view of Smith vehicle following the Saturday collision. 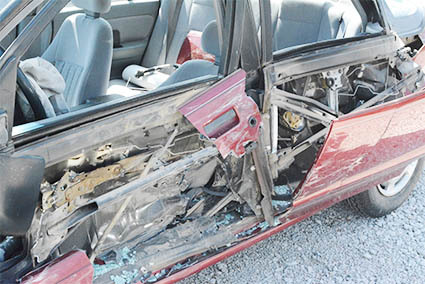 Three people were involved in a two-vehicle accident Saturday, May 14, at the intersection of Highway 275 and Highway 14, in Neligh. According to City of Neligh police officer Phil Hart, emergency workers were called to the scene at 1:11 p.m. According to Hart, Midwest Medical transported Smith to Antelope Memorial Hospital, where he was treated for minor injuries and released. Temme and her passenger, Lois Zegers, age 84, of Petersburg were also taken to AMH. Seatbelts were in use in the Temme vehicle. Hart said it is unknown if seatbelts were in use by Smith, but both front airbags did deploy. The Smith vehicle, owned by Jacequeline Smith of Butte, was considered a total loss, according to Hart. A citation was issued to Temme for failure to yield. Damage to the Cadillac was estimated at $5,000. Neligh Rescue, Midwest Medical, Neligh Fire, Neligh-Oakdale Jaws of Life, Antelope County Sheriff’s department and City of Neligh police assisted at the scene.